Accepted papers can be presented either orally or as posters. Posters will have a specific session for being presented to a larger audience, during which authors must be next to their poster to answer questions. The poster must not exceed the A0 (84 cm X 118 cm) portrait format. Please use an appropriate font size for the posters so that they are readable by the participants from 1.5 meter away. The poster message should be clear and understandable even without oral explanation. Please assure the poster is placed on the board before the beginning of the poster session. Authors are required to stand by their posters during the whole poster session, during which the participation certificates will be distributed. The poster must be printed beforehand and brought along to the conference by the author. Alternatively, the conference may provide a printing and transportation service but you must contact the secretariat at least one month ahead before the conference dates, inquiring about costs and deadlines. Please note that it is not acceptable to print A4 sheets and hang them at the poster board. 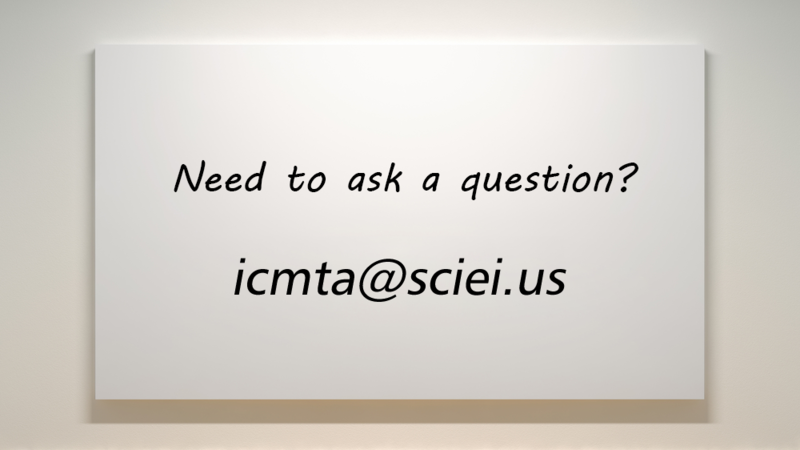 Send the paper to Easychair Submission System, (.pdf ony) , contact with Ms. Ashily via icmta@sciei.us if you have any questions.